Rainbows, mirages, and the green flash are topics that we aren't always able to cover in one of the class lectures. Or if we do it's on the Wednesday before Thanksgiving or the Friday before Spring Break when a large fraction of the students are absent (I usually cancel class the Wednesday before Thanksgiving by the way). The hope is that you the next time you see a rainbow or a mirage you might spot some features that you might have otherwise overlooked. 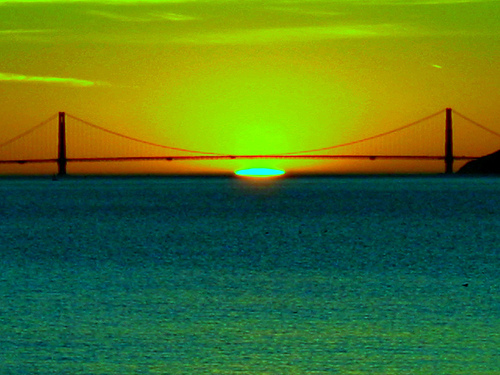 And if you know where and when to look you might be fortunate enough to see the green flash. 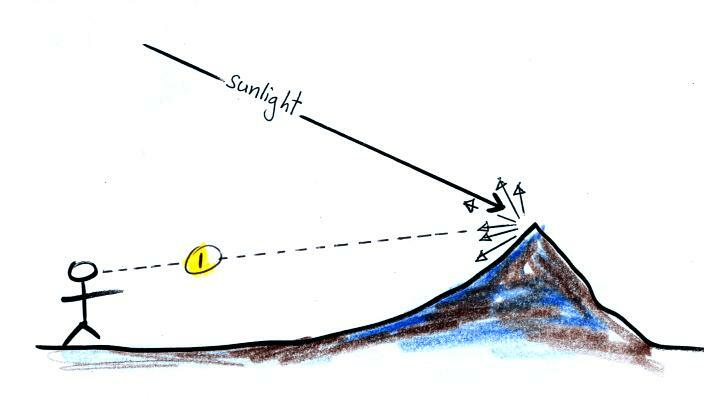 All three phenomena involve refraction which is the bending of light as it passes from one transparent material into another. 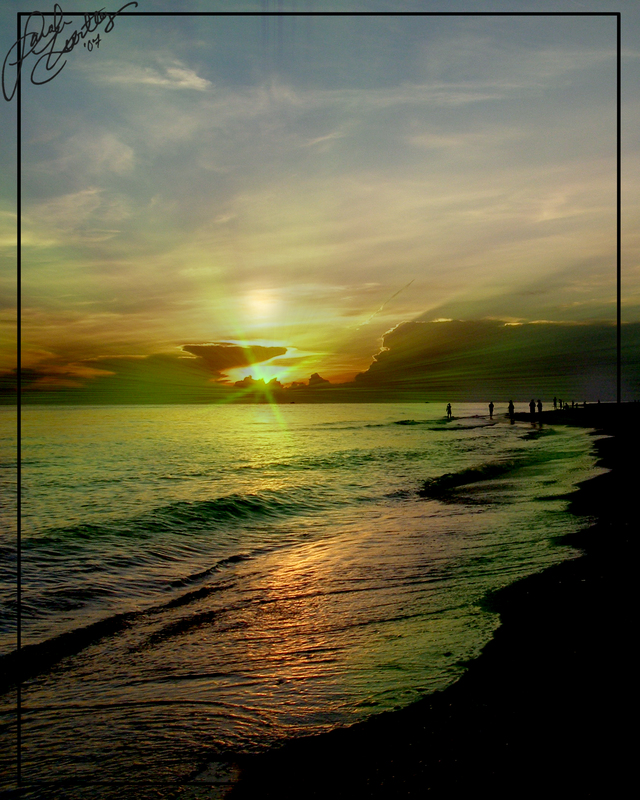 A ray of light might travel from air into water, ice, or glass, for example. 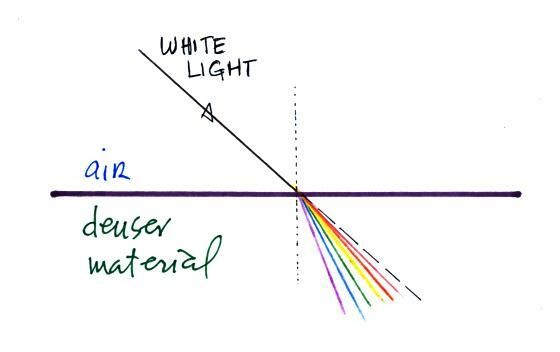 When the light passes into a denser material (as shown above) the light "bends toward the normal." 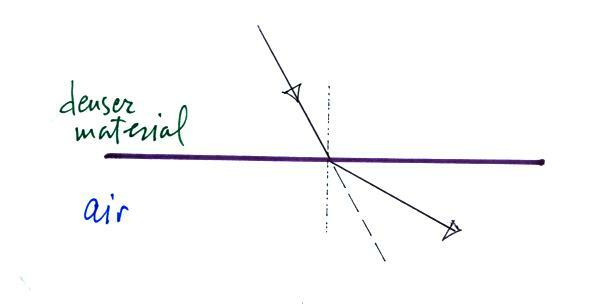 The normal is the dotted line shown above that is perpendicular to the boundary between the two materials. When the light travels from a dense material into a substance with lower density, it "bends away from the normal." The amount of bending depends on the wavelength or color of the light. The shorter wavelengths (violet, blue, green) are bent more than the longer wavelength colors (yellow, orange, and red). Thus white light can be split into its colors as shown below. 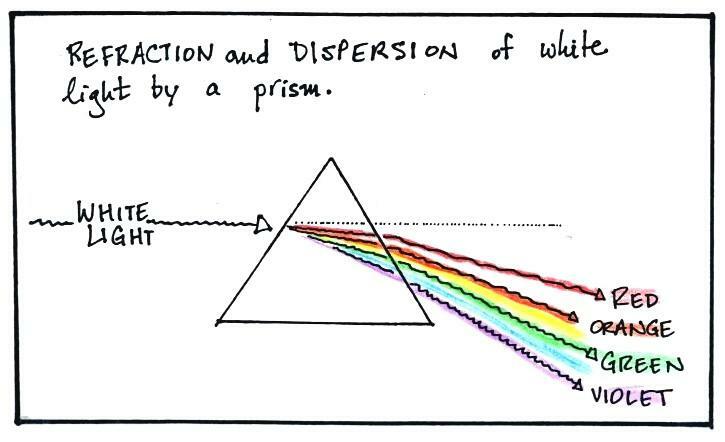 The separation of white light into colors by refraction is called dispersion. 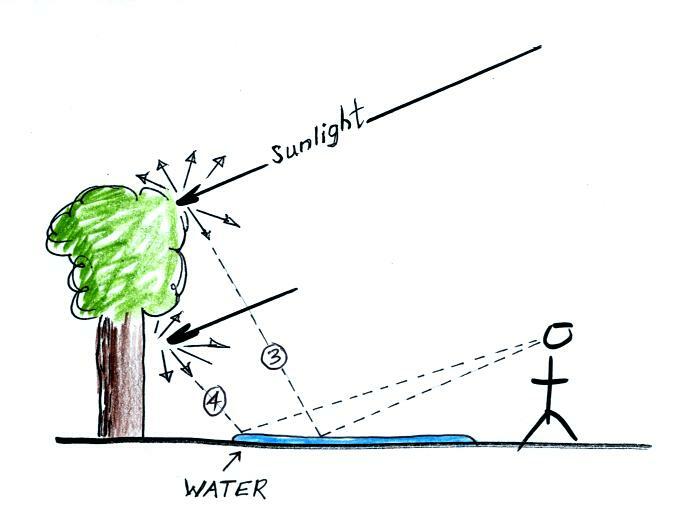 This is what happens when you shine light through a glass prism (the figure below is on p. 109 in the photocopied ClassNotes). The figure above is a closeup view of a ray of white light striking a spherical raindrop. 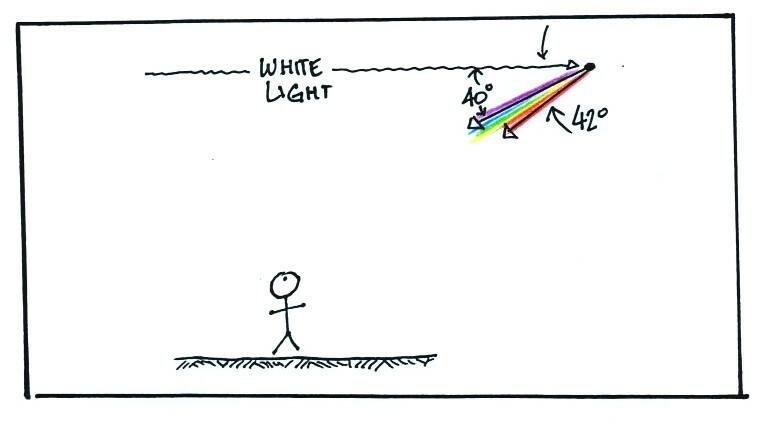 Some of the white light is reflected (a). The remainder (b) enters the raindrop (only the red and violet rays are shown inside the raindrop). This light is bent (refracted) and split into colors (dispersed). 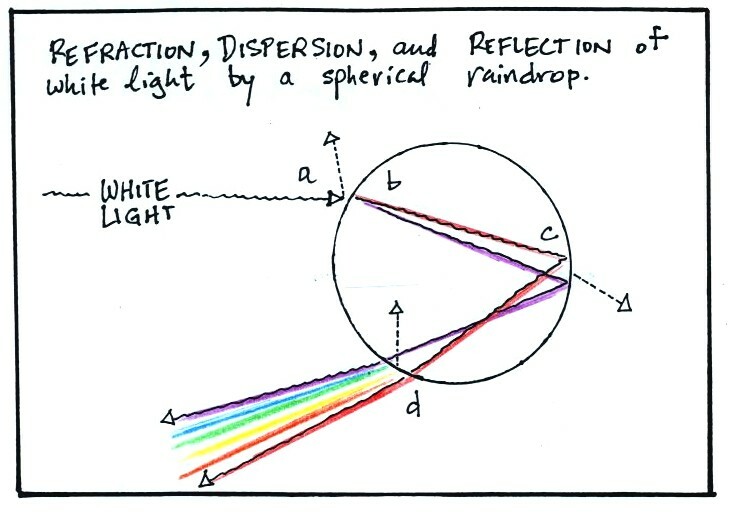 Some of the colored rays of light reflect off the back inside surface of the raindrop (c). 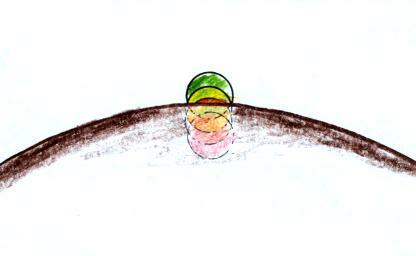 The colored rays of light emerge from the drop (where they are bend and dispersed some more) and head back, more or less, in the direction they came from (d). These are the rays you see in a rainbow. 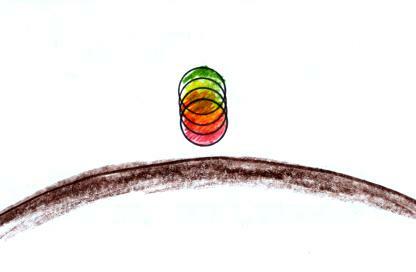 Someone down at the ground (standing with the sun at their back) would see colored light coming from the raindrop. However because each of the colors exits the drop at a slightly different angle (red at 42o, violet at 40o, the other colors at angles between 40o and 42o) they would only see one of the coming from a given drop. They would see the ray that was headed straight toward their eyes. The other rays would either pass above the person's head or strike the ground near the person's feet. The person would see red light coming the drop A which is higher in the sky. They'd see violet light coming from lower in the sky, from Drop B. 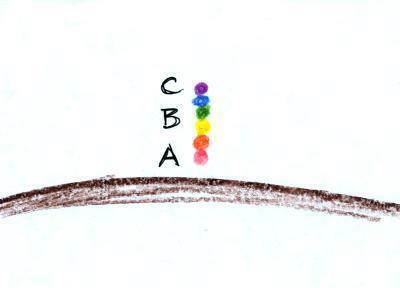 The person would see the other colors when they looked at the sky between A and B. The next picture shows what the person on the ground would see. Red light comes from the top edge of the rainbow, violet from the lower edge. Blue, green, yellow, and orange are found in between. Sometimes you'll see a faint secondary rainbow above the primary rainbow. 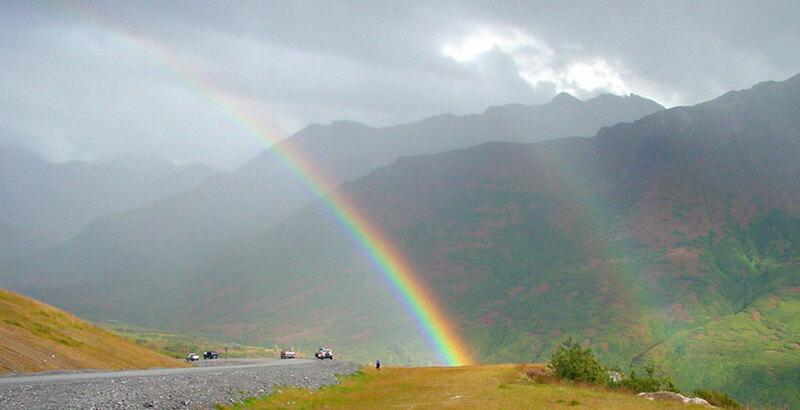 The following figure shows how this rainbow forms. White light strikes the raindrop at a slightly different position. The white light is again bent and separated into colors but then is reflected twice inside the raindrop before emerging on the front side of the drop. 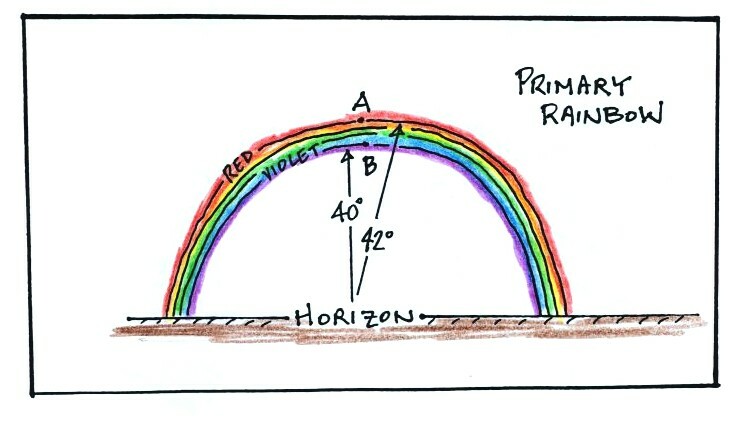 An observer on the ground would need to look 53o above the horizon to see the violet light and 50o to see the red light. 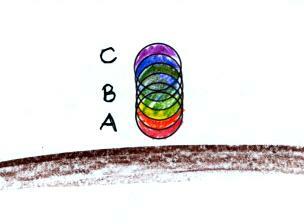 Here is a sketch showing both the primary and the secondary rainbow. The secondary rainbow is higher and dimmer than the primary rainbow. 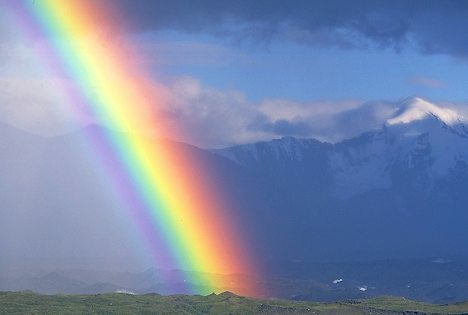 The order of the colors in the secondary rainbow is also reversed. 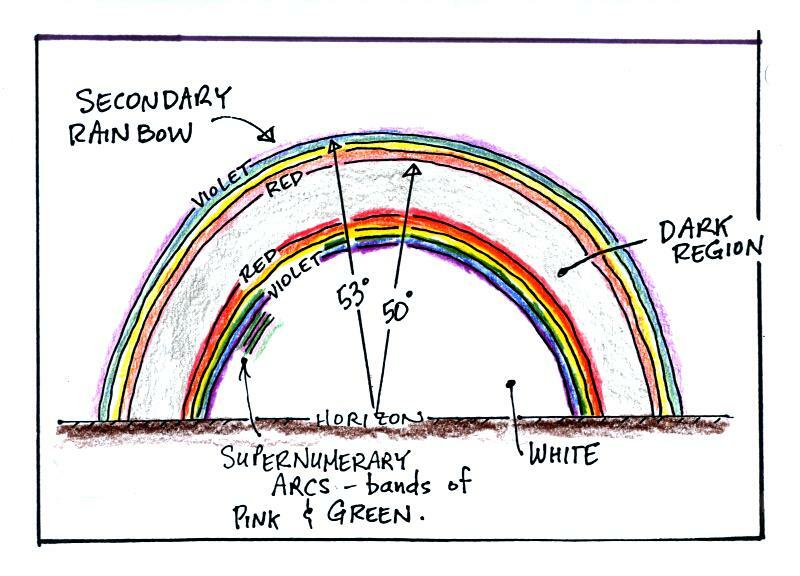 Supernumerary arcs (faint bands of pink and green) are sometimes visible below the primary rainbow (we won't go into what produces the supernumerary arcs). Also the sky between the two rainbows appears darker than the rest of the sky (we won't explain that either). 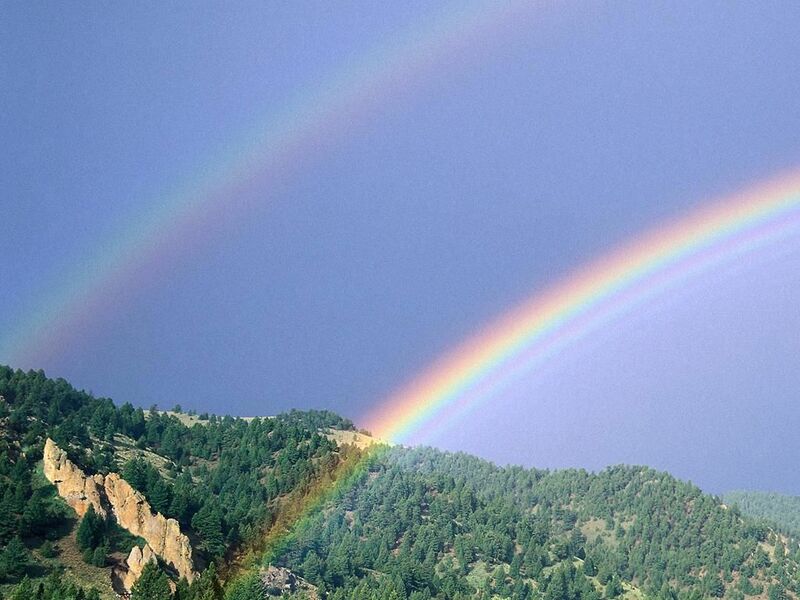 Here are a couple of nice photographs of rainbows. Next we'll look at the formation of mirages. 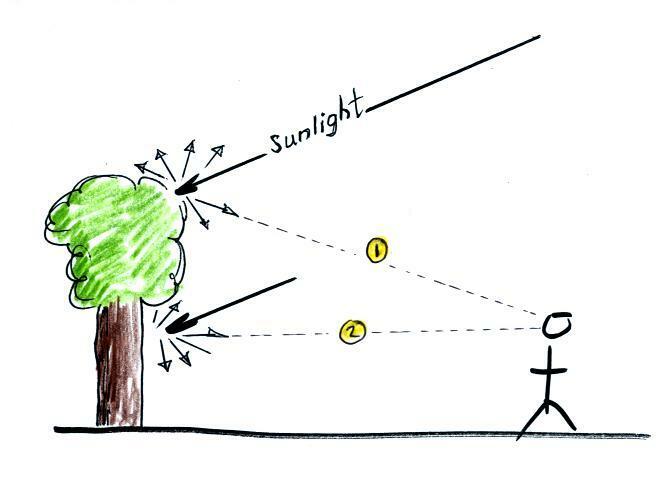 First here's a drawing showing sunlight striking a tree. The light is scattered (sent off in all directions by the tree). You would see green light coming from the top of the tree is you look back along Light Ray 1. You'd see brown coming from the tree's trunk when looking along Ray 2. 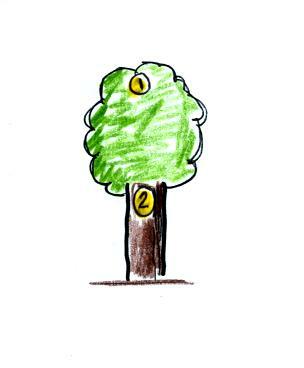 Here's what the person would see when they look at the tree. Next imagion there is water on the ground between you and the tree. You'd still see Rays 1 & 2 from the figure above, they aren't shown in the figure below. You'd also see rays of light coming from the tree if you look down at the water. Rays 3 & 4 are being reflected by the surface of the water. Now you see the tree when looking up and a reflection of the tree when looking down toward the ground. 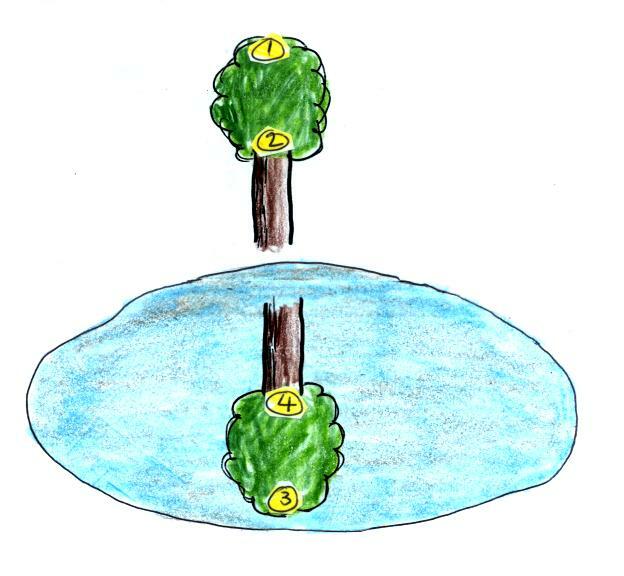 The blue light surrounding the tree (in the reflected image) is light from the sky that is reflected by the water. 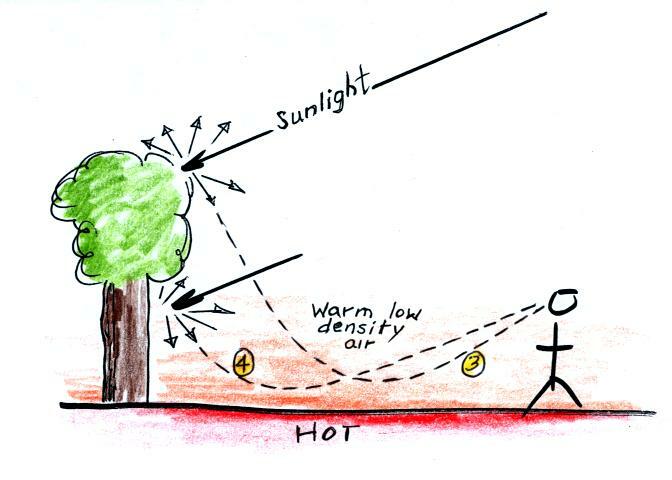 Light rays traveling into the warmer lower density air next to the ground are bent. 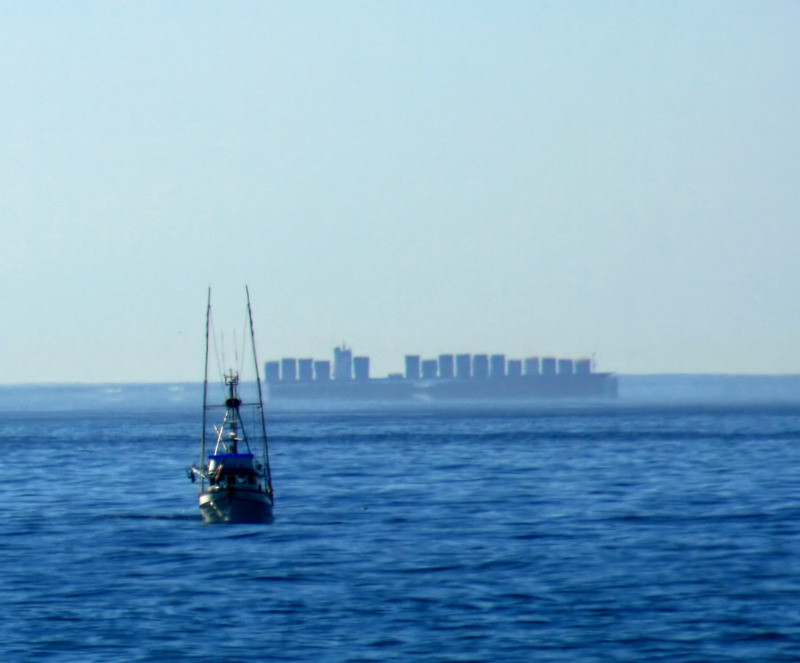 This is an inferior mirage. 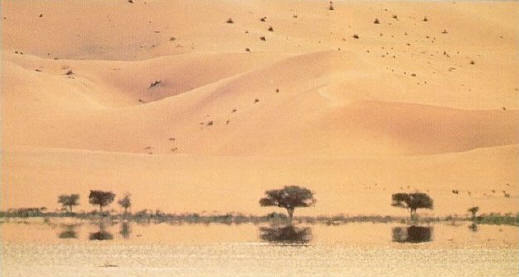 The mirage image is inverted and below the normal image of the object. Your brain isn't able to distinquish between these two situations. Since it's more familiar with light being reflected by water your brain just assumes that refracted light and a mirage is the same thing. The blue light surrounding the inverted image is blue light coming from the sky. Here are some examples of inferior mirages. 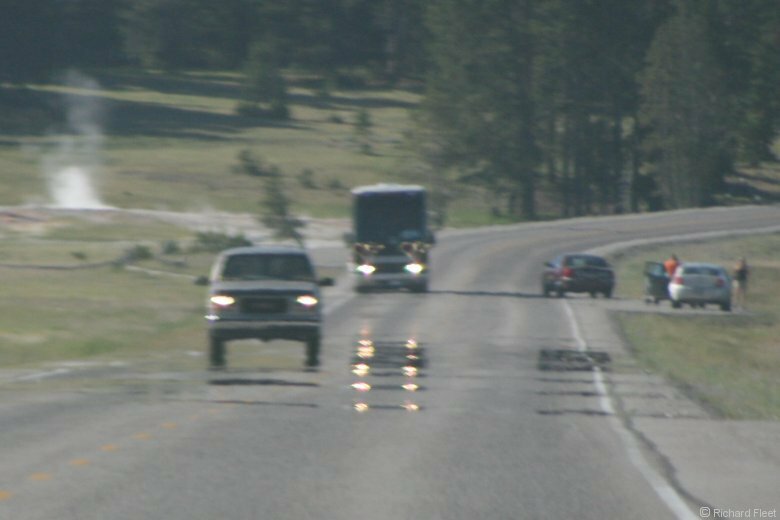 The black road surface gets hotter than the ground on either side of the road. Light from the sky is being refracted and sent toward your eyes. An inferior mirage will make a hot road surface look like it's wet. It looks like light from the sky is being reflected but it's not. It's being refracted. Here's what happens if you look at the top of a mountain. Now the ground and the air next to the ground are cold. The light rays are bent as shown above. Ray 1 now hits the ground at your feet. When you look a little higher in the sky (higher than you had to look to see Ray 1) you'll now see Ray 2. This is a superior mirage and will make the mountain appear taller than it really is. A superior mirage is a little harder to spot because you only see one image and the mirage image isn't upside down. 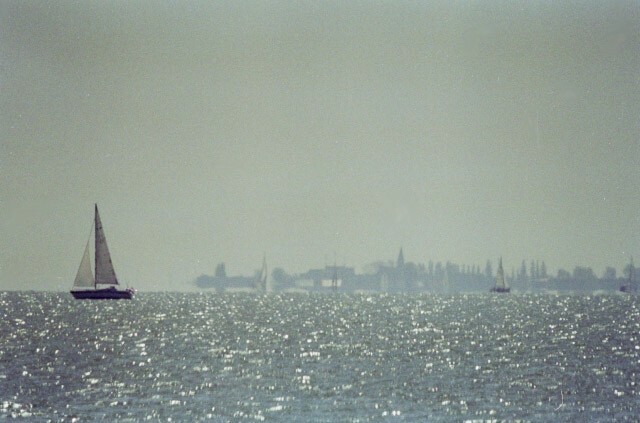 Here are a couple of photographs of superior mirages. 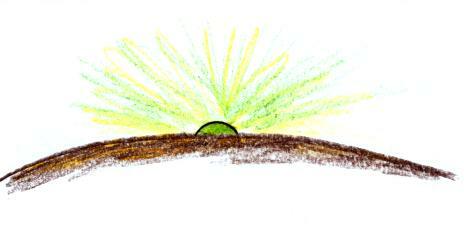 Finally I'll try to explain and illustrate the formation of the green flash. This refers to a flash or spot of green light that is sometime visible just as the sun is setting (it is also the name of a brewing company located in San Diego). It's a little harder to understand. 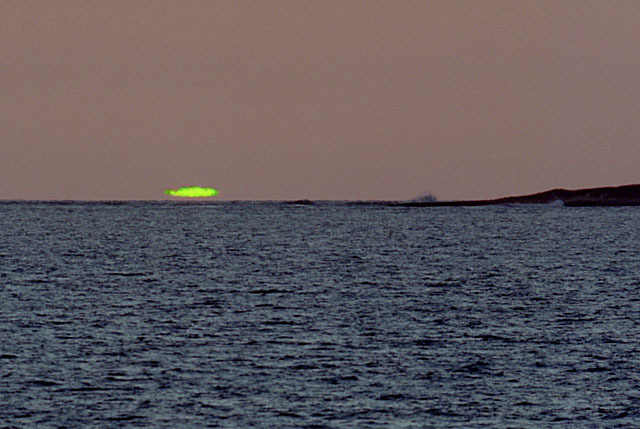 Refraction is involved again in the formation of the green flash. As the sun sets, rays of white light strike the top of the atmosphere and are bent. The amount of bending is greatly exagerated above. 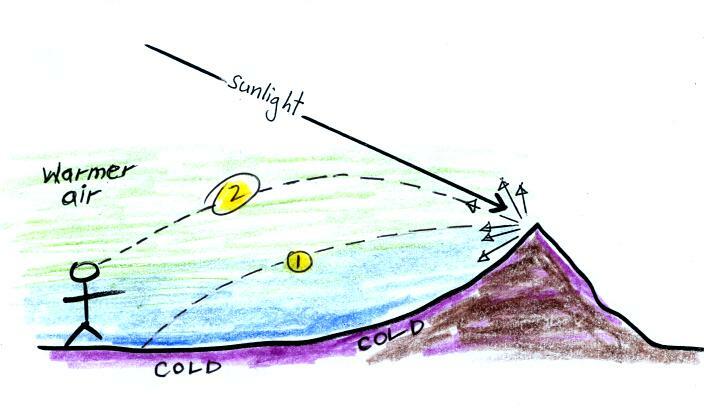 Now we've draw three different rays of sunlight striking the atmosphere at different locations. The person on the ground would see violet light when looking up at Point C, green light from Point B, and red light from Point A which is lower in the sky. 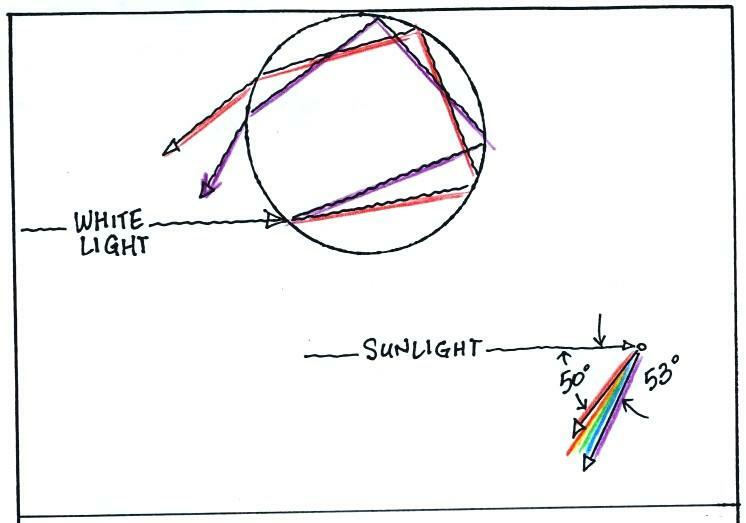 If the sun were a point of light in the sky there might be enough bending that you'd see 6 separate spots of light of different colors above the horizon as sketched below. A spot of violet light at Point C a little bit above the horizon and some red light closer to the horizon at Point C. As the sun set the points of light would disappear one by one below the horizon. The sun isn't a point of light, it's a bright disk. So refraction of sunlight means the sun's disk gets smeared out slightly into a set of overlapping disks of different colors. The colors that mix together in the middle produce white light (not the the dark mix shown above). And there's one more complication. 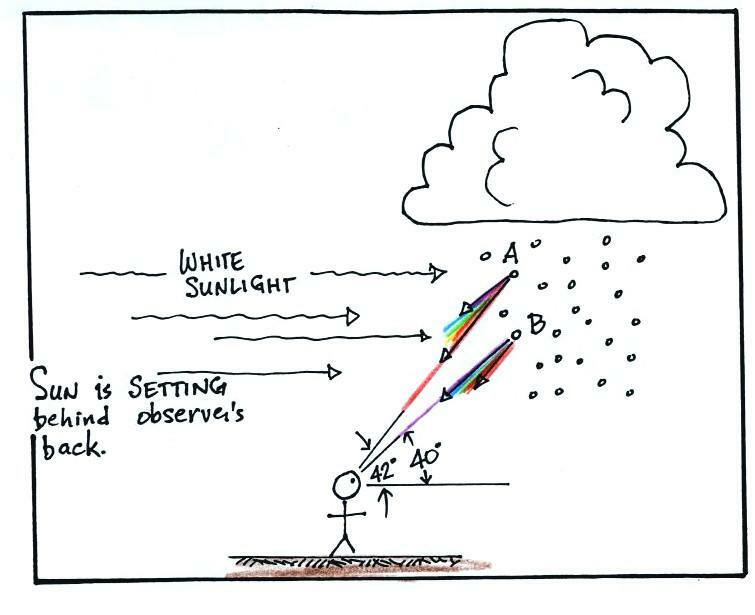 As the different colors travel through the atmosphere (and they're taking a long path at sunset when the sun is low in the sky) the shorter wavelengths get scattered more than the longer wavelengths. Scattering means the shortest wavelengths, the blue and violet light, get removed from the beam of sunlight and don't make it to the ground. So rather than a set of 6 disks of 6 colors you really only have 4 disks as shown below. And this is what moves below the horizon. If you watch closely you might just catch the edge of the last disk, the top disk, the disk of green light, before it goes below the horizon. Because it is the last you'll see just the green light. It's something you might never see. But definitely worth it if you succeed.